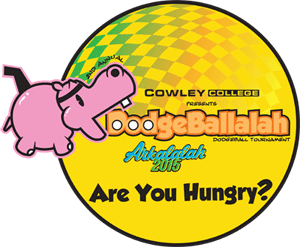 Cowley College is hosting the second annual Arkalalah Dodgeball Tournament, DodgeBallalah, on Thursday, Oct. 29 inside W.S. Scott Auditorium. The family-friendly event begins at 6 p.m. and is open to the public. Spectators and fans are admitted free and are welcome to show their team spirit. Put together a team consisting of six to 10 players, 18 and older, raise the team entry fee then register and pay online at cowleycollege.wix.com/dodgeballalah. Register before Oct. 16 for only $75 and also receive a free souvenir team t-shirt. After the early bird deadline the cost is $80 per team and shirts are $5 each. The deadline to register is Oct. 27. Along with bragging rights, winners of the tournament will receive a bag of prizes, a trophy, and $250 courtesy of LiftCo, LLC towards the charity of their choice. Prizes will also be awarded for Sweet Style, Biggest Loser, and The Golden Wrench. Checks can be made payable to Cowley College, C/O Marketing, 125 S. Second, Arkansas City, KS 67005.